Burkholderia glumae (BPB) presumably induces a grain rot symptom of rice that is threatening to rice production in most rice producing states of the USA. The present study was to identify the causal agent of BPB, virulence based on hypersensitive reactions and distribution of the pathogen within a plant. 178 rice panicles samples were analyzed with semi-selective media (CCNT), polymerase chain reaction (PCR) with bacterial DNA gyrase (gyrB) specific markers, and hypersensitive reactions on tobacco leaves. A total of 73 samples out of 178 produced a yellow bacterial colony with similar morphology on CCNT medium suggesting they were bacterial panicle diseases. However, with PCR reactions we only determined that 45 of 73 were due to B. glumae, and the causal agent for the remaining samples was undetermined. Within the 45 samples, 31 highly, 6 moderately, and 5 weakly virulent isolates were grouped based on lesion sizes of the hypersensitive reactions. Pathogenicity variability among the 45 B. glumae detected suggests that different degrees of host resistance exist. 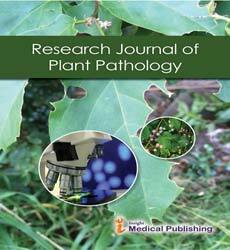 To determine the existence of bacteria in different plant tissues, naturally infected plant parts were examined with CCNT media and PCR analysis. B. glumae was again isolated from seeds followed by stems and sheaths from light yellow pigmented CCNT media. In contrast, roots and leaves show no visible yellow pigment on CCNT. Consistent PCR products were produced from the stem, sheath, and seed, but not from the root and leaves. These findings suggest that B. glumae is distributed in the stem, sheath, and seed, and not in the leaf and root. Together this study demonstrated the usefulness of artificial culture media, tobacco reactions, and DNA test with PCR for characterization of BPB, and distribution of bacteria in plants. These findings will help to understand the mechanism of bacteria translocation in plants.